with NX Seal and Shrink All-In-One you can wrap, heat seal, and shrink on the spot. Items can be grouped or mixed and matched with personalised labelling and advertising inserts. It has built-in sealing timer and requires no pre-heating: it is ready for use in 1 to 4 seconds. The Hot Air Shrink Gun, included, plugs directly into the sealing unit. 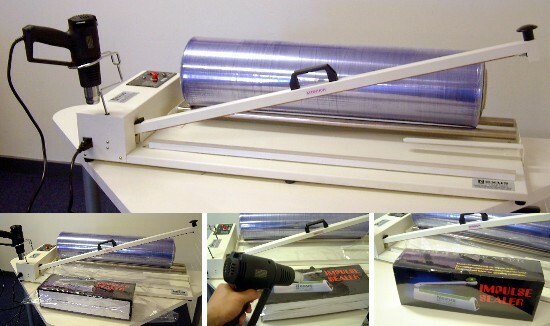 Use centrefolded PVC shrink film (Not Included). It can also be used with any poly tubing without heat shrink for just to seal and cut off 100%. 300mm Sealing Width, also available in 450, 600mm and 900mm.